Fend off a stone giant invasion, raid magical dungeons, and unlock the mystery of an ancient empire with the Pathfinder Adventure Card Game: Fortress of the Stone Giants Adventure Deck. 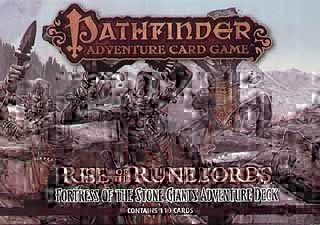 This 110-card expansion to the Pathfinder Adventure Card Game: Rise of the Runelords Base Set includes new locations, monsters, villains, loot, and more, as well as 5 new scenarios that constitute the complete Fortress of the Stone Giants adventure. Continue your character's legend with the Pathfinder Adventure Card Game: Fortress of the Stone Giants Adventure Deck.